Viking Orbiter Main Propulsion/Orbit Insertion engine produced by North American Rockwell /Rocketdyne (manufacturer designation RS-21) under contract to the Jet Propulsion Laboratory (JPL) for the tandem 1975-1980 Viking Orbiter/Landers Robotic exploration missions to Mars. The RS-21 Viking Propulsion system received the further Rocketdyne designation RS-2101c to distinguish it from the RS-2101a (a similar engine developed for the Mariner Mars spacecraft).This bipropellant, REGEN cooled engine is fed by a hypergolic mixture of Nitrogen Tetroxide and Monomethylhydrazine (N204/MMH); use of hypergolics increased engine reliability as the constituent propellants ignited on contact when applied through the injector plate into the thrust chamber, eliminating the requirement for a separate ignition source. The RS-21 is a derivative of the RS-14 (the RS-14 was used on the Minuteman ICBM post-boost phase warhead delivery vehicle). It is capable of producing thrust (in a vacuum) of 136 kgf with a specific impulse (ISP) of 294 sec (approximately 1323 Newtons) translating to a delta-V of 1480 m/s (3310 mph). The engine was a flight ready spare and exhibits evidence of having been test fired. 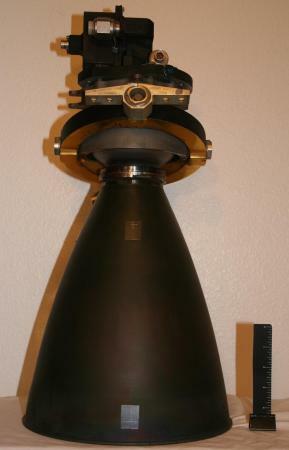 It measures 20 inches in length by 10.5 inches (maximum diameter of Nozzle) independent of its Rocketdyne transport case and includes the Gimbal Ring assembly which supported up to 9 degrees off-axis nozzle positioning for thrust vectoring (spacecraft steering). The engine was utilized to provide midcourse trajectory corrections while the Viking was enroute to Mars and executed the orbital insertion and orbit trim maneuvers of the Orbiter/Lander spacecraft upon arrival at the red planet. Orbital insertion of Viking 1 required a long engine burn-38 minutes of thrust, which consumed 1063 kilograms of propellant, slowing the spacecraft from its initial approach speed of 14400 kilometers per hour (8948 MPH) to 10400 kilometers per hour (6462 MPH). To bring the spacecraft to the proper point at periapsis (1511 Kilometers/939 miles above the planets surface), the spacecraft was placed in a long, looping 42.6-hour revolution of the planet, reaching first periapsis; orbital apoapsis was ultimately trimmed to 32800 Kilometers (20,381 Miles above the Martian surface). The primary objectives of the Viking orbiters were to transport the landers to Mars, perform reconnaissance to locate and certify landing sites, act as a communications relay for the companion landers, and to perform their own scientific investigations. The orbiter, loosely based on the earlier Mariner 9 spacecraft, was an octagon approximately 2.5 meters in diameter. The total launch mass was 2328 kg, of which 1445 kg were propellant and attitude control gas.